Whether you're a professional Captain or a weekend warrior, our Professional Series Kite Box is the most complete set-up you will find for kite fishing. You will find everything you need for two complete kite rod set-ups as well as all the accessories to keep you fishing for a ling time. 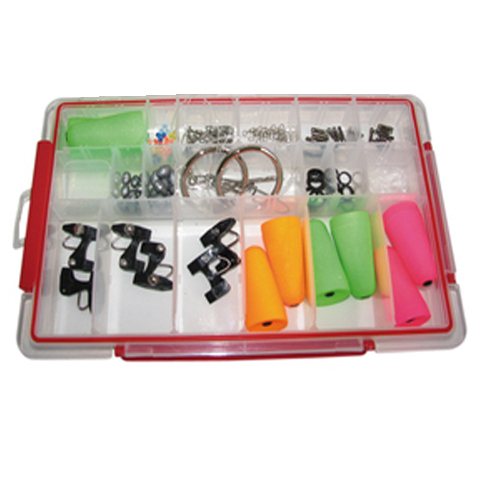 Packaged in a water resistant box with 6 non-weighted floats, 2 weighted floats, 6 predrilled kite pins (2 small, 2 medium, 2 large), 8 small release pin rings, 8 large release pin rings, 10 small swivels, 10 medium swivels, 10 large swivels, 10 snap swivels, 10 beads, 10 1/8th oz leads, 10 1/4 oz leads, 2 High Flyer Rings, 3 Bridle Needles, 20 Bridle Bands. Save over $30.00 if purchased separately.